The ski region of Grandvalira is Andorra's largest, composed of over 131 miles (210km) of runs linking six villages - Pas de la Casa, Grau Roig, Soldeu, El Tarter, Canillo, and Encamp. Situated in the heart of the Pyrenees, this beautiful mountainous region is truly a skiing paradise, with a range of slopes which cater for those just starting out, as well as the more avid skier who seeks the adventure of more challenging terrain. The most central village is Soldeu, popular with families and those attending the excellent ski schools. Nearby Pas de la Casa appeals more to youngsters enjoying the lively après ski scene. 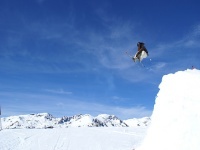 Grandvalira offers some of the finest beginner and intermediate slopes in the world, as well as some exciting black runs for more experienced skiers to let loose. There is a range of other activities accessible, such as snow-mobiling, dog-sledding, ski bikes, and tubing. Of course, the main attraction remains the skiing, and with first-class ski schools, modern and efficient lift systems and reliable snow, this is the perfect choice for a ski holiday for beginners and intermediates. We are looking for contributors for our Grandvalira travel guide. If you are a local, a regular traveller to Grandvalira or a travel professional with time to contribute and answer occasional forum questions, please contact us.